I remember as if it was yesterday - in April 2014, when my blog was a tender two months old, a fresh copy of Josh Malerman’s Bird Box landed on my desk. I couldn’t believe my luck! Amongst many aspiring online writers, I had been selected by a PR agency to receive a preview copy of the thrilling novel. In fact, the book had been my very first EVER gifted PR sample, so even though I found the read overall a bit average, it still holds a special place in my heart and it goes without saying that I eagerly anticipated the Netflix adaptation and binge-watched it the moment it got released. Usually, I’m not too bothered about horror or thriller stories but the moment I got Bird Box out of its package, I was intrigued by its neat presentation and I was still overjoyed that I had been selected to review the book. In my enthusiasm and eagerness, I started reading straight away – aw, those were the days of early blogging! Very quickly one page turned another, chapter by chapter. I was hooked for days, couldn’t put it down and completely indulged into the dark, mysterious and gripping world of Bird Box. Now that Netflix has brought the eerie novel to life, I meticulously found myself following the plot. Adaptations are always tricky – especially when you translate a book into a two-hour film, but in this case, Netflix has done a great job. The scenery is incredibly well chosen, the atmosphere well captured and even if I wouldn’t have known that this was an adaptation of Malerman’s book, I felt immediately taken back to the dark world that I first entered in 2014. There are barely any changes and the plot follows precisely the novel. The setting is a modern, apocalyptic America where horrifying incidents and strange happenings leave people in fear and terrifying horror. No one knows exactly what is going on - only that people brutally kill each other all of a sudden or they die painfully by the sight of something very haunting. For a long time rumour has it of so-called “creatures” that make people go mad. The only protection seems to be wearing blindfolds and hideaway in homes. A life in isolation, darkness, and fear begins for those who wish to survive. In this gruesome world lives young mother Malorie with her two little children. The plot's frame story centers on their struggle to survive and starts with them leaving the safety of their home to travel blindfolded down a river in the hope to find help and other survivors. A dangerous trip into the disturbing unknown begins. Whilst they embark on their risky journey, in alternate flashbacks the reader/viewer learns about Malorie’s story which started four years ago. Pregnant from a one night stand, she lost her sister and parents when the incidents began. In her desperation and grief, she answers a classified ad in the newspaper that offers shelter and protection from the killing. In the next chapter, Malorie finds herself living with six strangers in a house shielded away from the outside world with limited space causing tensions and mistrust under the flatmates soon. On 304 pages, Malerman described extraordinarily the fear of the unknown and the horror the protagonists had to live in and had to go through personally - an atmosphere that the movie captures with ease. From the first chapter onwards, I remember the plot was very straightforward and contained a strong and well depicted Malorie as the main character. Sandra Bullock is a superb cast for the role as she embodies a fearless mother who is protective of their children, yet has to hold a strong and harsh appearance to guarantee their survival. In the novel, Malerman used language effectively to set atmospheric scenes, tension and suspense thus created the most emotional impact on the reader (goose bumps included). The language structure and words were chosen wisely, not overly complicated which allowed a constant reading flow and made Bird Box an enjoyable page-turner. The same applies to the movie, which is told in a very linear narrative which flows naturally. At no point did I feel bored or disengaged and I felt the movie allowed easy access to the story, its characters and to be taken on this dangerous journey. So why did I feel the book was only average? Well, both book and movie remain widely shallow and you can’t shake off the feeling that something is missing. Certain passages in the middle part could have been shortened for instance and instead, some remaining questions which stayed with me at the end could have been explained. The ending did feel rushed to me and wasn’t round enough…..something was missing for me and though the whole creature situation when first introduced was shocking, it wore off pretty quickly. Neither Malerman or the adaptation gave enough explanation. 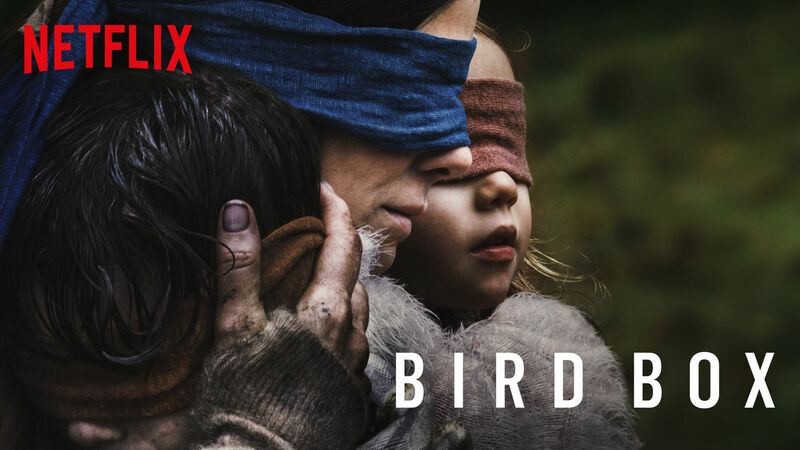 There was substance lacking big time and once again when I finished with Bird Box I felt dissatisfied…like “This is really it?”. In terms of character development, I found Malorie a likable character as most of her development was described implicitly through her actions. She was this brave, patient and rational person who could be proud of her achievements and her children – again this role could have not been played by any other than Sandra Bullock. It is actually astonishing, how much of the plot and details I remembered when I watched the movie. Whereas in the book some of the minor characters were less feasible, I found it worked well in the movie, partly because working through detailed descriptions and character features were easily replaced by the visual portrayal of the actors. I also found Olympia and John Malkovich as Gary very well casted. Many of the flatmates still remained vague and it was hard to care and feel for them. Out of the flatmates, Tom was probably the most developed character but he had to as he was Malorie's sign for hope. The romantic twist in the film was actually quite refreshing and worked in favour of the story. Other characters such as Cheryl, Joules, Felix and Don made hardly a distinction in the film and in the book. Book Don needed some attention and development as he was a key figure in the main conflict and showdown. It was him who refused Gary straight away and a few pages later he seemed to be completely under his spell, though the text was vague about Gary's influence on Don. Back then reading the novel, I found it hard, irritating and too quick how Don's character changed from literally one page to the other. The sudden mood swings and character change didn’t make much sense to me at all and the text offered little information to find a satisfying explanation. The movie has definitely solved that problem more cleverly and offered a smoother transition to the next part of the story: the exodus of the house and the trip down the river. Overall, Netflix has produced a decent adaptation that is worthy of its literary template. The film is entertaining and stays very true to the story, with a strong female lead and overall supporting cast. Scenery and atmosphere capture very well the tone and tensions of the book. However, like the book, the film doesn’t provide any more knowledge on the main conflict – a missed chance when translated into the medium of film, which the creative freedom could have easily fixed. Therefore, Bird Box remains entertaining but shallow.